This lesson will show you how to send your first job through to QuickBooks Online. Then go to the Invoicing page to approve the invoice to be sent through to QuickBooks Online. 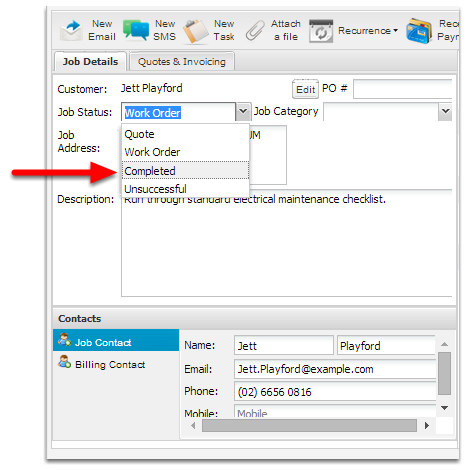 To send the invoice to QuickBooks online, tick the job and then click the Approve button. Once you've pressed the Approve button, the invoice will begin syncing to QuickBooks online. If there are any issues processing the job, you will get a red cross - hover your mouse over the cross to get additional information on how to resolve the issue. Once the invoice has successfully been raised in QuickBooks Online, the spinning circle will turn into a green tick. Congratulations, you've just sent your first job through to QuickBooks Online!